Resilience has rapidly become a popular term in many disciplines including the discipline of urban planning. In the last few years, the concept of resilience is increasingly used in urban policy and strategies. Resilience appears to be fast replacing sustainability. The concept of sustainability has been at the forefront of urban policy discourse since the Brundtland Commission of the United Nations issued the concept of sustainable development in 1987. Sustainability aims to minimize our impact on the environment, but has one small flaw. Sustainability puts the environment back into balance, but the way the environment behaves is difficult to predict. We are living in the environment with a heightened sense of uncertainty and unpredictability. There are many environmental events that are out of our control and we need to survive when the environment attacks us. 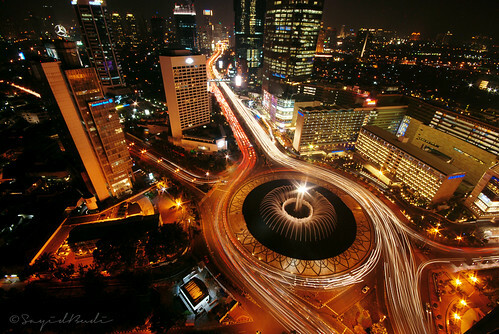 Heart of Jakarta, originally uploaded by Sayid Budhi. Many scholars refer to C.S. Holling who coined resilience in his 1973 seminal paper on systems ecology. The word resilience stems from resilire, Latin for bounce. The Rockefeller Foundation commissioned a team to develop a comprehensive literature review of resilience and released the report in September 2011. The review focuses on three resilience frameworks including resilience for an object, a system and an adaptive system. Resilience for an object is bouncing back faster after stress, enduring greater stresses, and being disturbed less by a given amount of stress. Resilience for a system is maintaining system function in the event of a disturbance. Meanwhile, resilience for an adaptive system is the ability to withstand, recover from, and reorganize in response to crisis (Martin-Breen and Anderies 2011). How about urban resilience? I define urban resilience as the ability of urban communities to recover from disasters and disturbances in a sustainable way, maintain a good quality of life and increase its coping capacity to reduce the damages from an unpredictable disaster or disturbance. Resilient urban communities are better prepared for uncertainties and able to adapt to changing conditions. The World Economic Forum released its 2013 Global Risks Report and included a section of resilience in the report. It is the first Global Risk Report of World Economic Forum that discusses the global risks from the resilience perspective. The report identifies five components of national resilience and I believe these five components are applicable for the urban context. The components of urban resilience include robustness, redundancy, resourcefulness, response and recovery. Robustness refers to the ability to absorb and withstand disaster and disturbance. Redundancy is the excess capacity to enable the maintenance of core function in the event of disasters and disturbances. Resourcefulness involves the ability to adapt and respond flexibility to disaster and disturbances and transform a negative impact into a positive one. Response means the ability to mobilize quickly in the face of disturbance. Recovery is the ability to regain normality after a disaster or disturbance. Building urban resilience refers the development of these five components in the urban system including buildings, infrastructures and communities. There are two modes to build resilient urban communities including mitigation mode and adaption mode. Mitigation mode refers the intervention that is aimed to reduce the long term risk and hazards and also avoid unmanageable impacts of disasters or disturbances. Adaption mode involves the adjustment that is aimed to moderate damages in the event of disasters or disturbances or exploit beneficial opportunities and also manage unavoidable impacts of disaster or disturbances. Building urban resilience is not a short term program. It’s a long term program and requires coordination among stakeholders in the city including government agencies, private companies, and residents to prepare for, withstand and recover stronger from disaster, disruptions and chronic stresses. In May 2013, the Rockefeller Foundation announced the Centennial Challenge of 100 Resilient Cities. The Rockefeller Foundation received nearly 400 applications from cities around the world including thousand-year-old cities to megacities dealing with rapid urbanization. A panel of judges including former President Bill Clinton and Nigerian President Olusegun Obasanjo reviewed the applications particularly on how the cities are approaching and planning for resilience and their commitment to building resilient city. On December 3, 2013, the panel selected the first set of 33 cities for the Rockefeller Foundation’s 100 Resilient Network. The 33 selected cities include Semarang, Melbourne, New York City, San Francisco, Los Angeles, New Orleans, Ramalah, Rotterdam, Rome, Rio de Jainero, Mexico City and Dakar. The full list of the 33 selected cities can be found at this link. These cities have implemented innovative programs and demonstrated positive results for resilience. For example, New Orleans had experienced in dealing with and rebounding from Hurricane Katrina and Isaac and the Deepwater Horizon Oil Spill and learned important lessons about being a resilient city. Similarly, New York City has learned valuable lessons from Hurricane Sandy and developed programs to protect its residents from coastal flooding and sea level rise that could lead to replicable models for other coastal cities. Innovative programs of increasing resilience and lessons learned in recovering from disasters and catastrophes from those selected cities should be introduced to other cities for possible replication including to Indonesian cities. Jakarta and other Indonesian cities should prepare for possible catastrophic or disruptions and should develop systems to recover stronger from catastrophic or disruptions. Semarang was selected because it has innovative programs to address flush floods and tidal flooding including rainwater harvesting, vetiver grass plantation, mangrove rehabilitation and early warning system for floods and vector-borne diseases. Other Indonesian cities should learn from Semarang and other selected cities and have systems in place to recover, persist or even thrive amid disruptions. Many congratulations on being selected by the Guardian Cities website as Jakarta's best urban blog because you cover [our] home city "most insightfully".